George is in his 50s. He has never married, and never wants to marry. Well, not a human wife. He is married to the sea. Last time we visited George, his pure white fishing boat with blue trimmings was docked by the big jetty wall made of stacked giant stones jutting off the seaside esplanade. Greek coffee shops lined the town’s edge where a large man with a neatly shaved beard gutted tiny fish, unswayed by the presence of a pack of hungry street cats straddling his feet, ready to jump after any entrails that he might throw away. Just over a year later, we see the same middle-aged stranger. This time, he is sitting in the tranquil setting of an almost empty cafe. He doesn’t know us, but we recognise him. Koroni hasn’t changed a lot. Some of the outdoor cafe tables lining the Esplanade on the sea shore have moved, but the colourful fishing vessels decorating the aqua blue crystal ocean are the same. This town is home to a handful of fishermen, who appear to be at least 40 years of age on average. We spot a vessel displaying the head of an armed knight - a reference to Koroni’s glory-days of battles - a symbol like the crumbing Venetian castle on the hill, signifying that this town was once a powerful European landmark. Last time we were here filming, we saw the knight being freshly painted by two young men on the dock. A year later, this fishing vessel has already blended well into the timeless backdrop of sleepy fishing vessels dotting the seascape. There is, however, another significant change. George has moved his boat from one side of the seaside harbour to the other. The move confuses us. Today, he is much harder to find. Last time we saw him, he was threading hundreds of fishing hooks through his painfully dry, cracked hands. This time, as we approach him, I notice that his hands are much smoother. He is huddled over a small wooden boat, tinkering with its frame. The boat is nestled at the foot of several stone stairs leading up to the terrace of a classical-looking Greek restaurant, tucked away under some shady trees and a cliff. He comes up and greets us and gives us a hug and shares his warm larrikin-like smile, before leading us up the white-painted stone stairs to what appears to be his table. It is also white. Many things are painted white in this town. The e restaurant is almost empty except for a group of four men. We sit down by George’s empty ouzo glass. He orders himself a white wine and, for James, a beer and, for myself, some water. It is mid-afternoon and it is hot. A dry heat. His shirt exposes tanned flesh and two necklaces. One of them has a giant blue stone in the shape of a heart - an interesting piece of jewellery, so I ask where it is from. Last time we were here, he wore a necklace with a captain’s wheel in it, a symbol we understood, as he has travelled the world as a captain on big cargo ships to places like Australia, Bangladesh, Japan, China, Brazil, and New Orleans. George is full of sea tales, so it is likely every necklace of his has a story. Before he tells us the tales of the necklaces that he is wearing today, he gives us a present. He emphasises how precious it is, gently whispering through his tongue, as he slowly unwraps a tissue from his pocket. Like many Greek fishermen, good luck charms and superstitions are a part of his seafaring life, which is why he so carefully hands us his very tiny gift - a mollusc, what George calls an ‘eye of the sea,’ which he has taken from a clam that he pulled up from 120 metres deep. He too has an ‘eye of the sea’ fitted into one of the necklaces around his neck. He then proceeds to tell us the story about the blue stone on the other necklace. It was a gift from his Brazilian lover when his ship sailed through Latin America. He can’t remember the name of the bright, clear, lucid, stone, but he believes it is precious. When he returned home to Koroni, the nuns stationed inside the castle (whom he has helped before) wove him a black necklace to hang the stone on. They said that this necklace would protect him. It keeps him safe. He wears his necklace with pride. He finds joy in the superstitions of the sea and the women he meets, who provide him with spirited tales of care and protection. He orders a second wine. He then looks out to sea and sighs deeply. George is taking a break from fishing. He has been fixing his boat under the burning heat of the sun, while spending what leisure time that he has in this bar, looking out to sea - contemplating his past and future. We can see he is worried, more so than when we saw him last. He says that his catch is down by 80 percent from the last year. Reports vary, but the pressure on fish stocks across the Mediterranean is a worrying trend with the European Environment Agency reporting in 2016 that 70 percent of all fish stocks were being over-exploited. 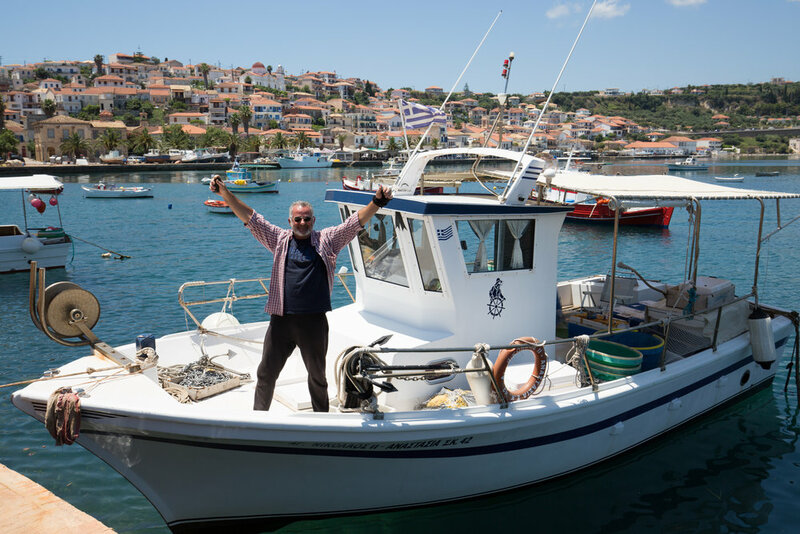 While I cannot validate George’s assessment, in 2015, the European Union reported a 14.3 percent drop in Greece’s overall catch rate, declining in just one year - two years earlier from this day where we are sitting with George, enjoying Greece’s crystal blue sea view. George says he has spoken to many fishermen on many islands, who also report significant declines. He is not sure what he is going to do about his future. He has said previously that he envies the rules in Australia that impose heavier restrictions on fishermen. Without strong rules and enforcement, he says fishermen have kept taking and taking until the fish stock are now almost gone. The little sleepy fishing village of Koroni with its ageing fishermen is changing after all. The Venetians and the Ancient Greeks had their moment to shine - and so, it appears, the era of the Greek fisherman will fade into the history books too. George knows he is powerless to change the past, or the fate that awaits his town. He is among the last of his generation. For a moment, this thought makes him frown. The expression on his face is gloomy and forlorn, but then quickly, he recovers and smiles widely. He laughs. His adventurous, cheery spirit is what will get him out of this mess. Maybe he will stop fishing and start a business in tourism, taking foreigners like us out to sea to some secluded white-sanded island beach? Maybe the next time we see him, he won’t be George the Fisherman - he will be George the Tour Guide. He will find a way to stay in the fishing village he grew up in. George, who has traveled the world, is at peace on the tranquil edge of this Mediterranean port. He believes that Koroni is the most beautiful place in the world, with its white painted houses, red brick tiles, blue painted trimmings and crumbling ancient castle, home to a vineyard of olive trees on the hill, and, of course, to its ageing fishermen and its wild, purring street cats.